Ford F-150 is dominating figure in the pickup segment but it also has had the title of the best-selling vehicle in the US for a few decades. This model definitely has become the benchmark in the whole pickup segment and its last redesign was certainly a revolutionary. However, the Ford has continued to upgrade this model in last two years. For the 2017 model, it introduces nothing less than redesigned 3.5-liter turbocharged V-6 engine, a new 10-speed transmission, and high-performance Raptor model. It, of course, offers a dazzling number of variants and let see what 2017 Ford F-150 Limited has to offer. 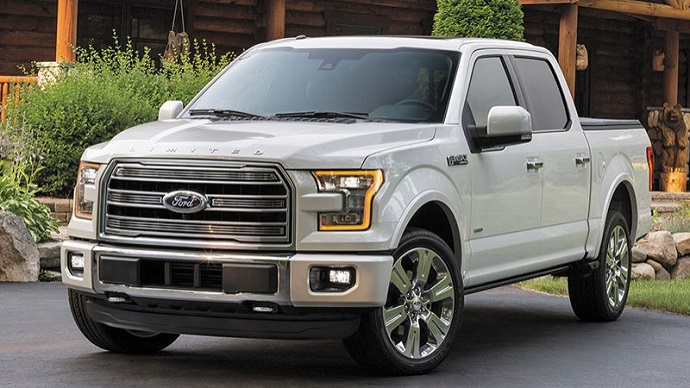 The Ford F-150 sits at the top of the line and offers unique styling, interior and most of the features comes as standard on this model while they are optional in other versions. This model comes with SuperCrew cab style which is the most spacious version with full-size rear doors. Also, this model is limited to a 5.5-foot bed length. Upgraded V-6 EcoBoost engine is also mandatory. Like the every version of the F-150 the Limited model also rides on the fully boxed frame and has aluminum made body panels. The overall design and shape are like on the other models but it adds a unique touch of style and luxury. On its front side, the Limited model has unique grille with bar style and satin finish and chrome surround. The grille sits between quad beam LED headlights with integrated LED DRLs. There is also chrome front bumper with fog lights. The rear bumper is body colored and model includes LED taillights. Among other exterior features, this version also includes tow hooks, cargo box tie-down, LED box lighting, remote tailgate, power-deployable running boards, power and heated side mirrors with memory feature, unique 22-inch wheels and much more. Inside the cabin, this version features unique wood trim. Front bucket seats are heated and cooled with multi-contour leather padding. They also feature 10-way power functionality and driver memory setting. Rear seats come with the heating feature. This version also includes dual-zone automatic temperature control, ambient lighting, an overhead console, power pedals with memory, heated and power steering wheel, etc. Techwise, the 2017 Ford F-150 Limited model comes with SYNC3 infotainment system. It supports smartphone integration and also features a capacitive touchscreen, Siri Eyes Free, Wifi connection, etc. There are also satellite and HD radio, voice-activated navigation, premium sound system, etc. For the safety purposes, the model includes AdvancedTrac with roll stability control, blind-spot monitoring with cross-traffic alert, MyKey system, surround view cameras, lane keeping assist, lane departure warning, forward collision warning, etc. As we said earlier, an upgraded 3.5 liter turbocharged EcoBoost V6 engine is standard on the 2017 Ford F-150 Limited model. This engine features start-stop technology, dual-direct and port fuel injection system, and twin independent variable cam timing. It can produce 375 hp and torque of 470 lb-ft. Combined with this engine is a new 10-speed automatic transmission. The two-wheel drive is standard and all-wheel drive optional. This version has peak towing capacity of 12, 200 pounds. On the other hand, the fuel economy is 20 mpg combined or 18 mpg city and 25 mpg highway. If you want the 2017 Ford F-150 Limited model, its starting price is $59, 600 for two-wheel drive version. 2019 Chevy Avalanche: Is it coming? New Truck Models Copyright © 2019.